This amazing space wallpaper shows X-rays from Chandra and optical data from the VLT of the galaxy NGC 3115. Using the Chandra data, the flow of hot gas toward the supermassive black hole in the center of this galaxy has been imaged. This is the first time that clear evidence for such a flow has been observed in any black hole. 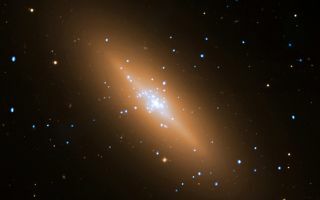 The new Chandra image also supports the previous optical observations that suggest that NGC 3115's black hole has a mass of about two billion times that of the Sun. This would make NGC 3115 the host of the nearest billion-solar- mass black hole to Earth.